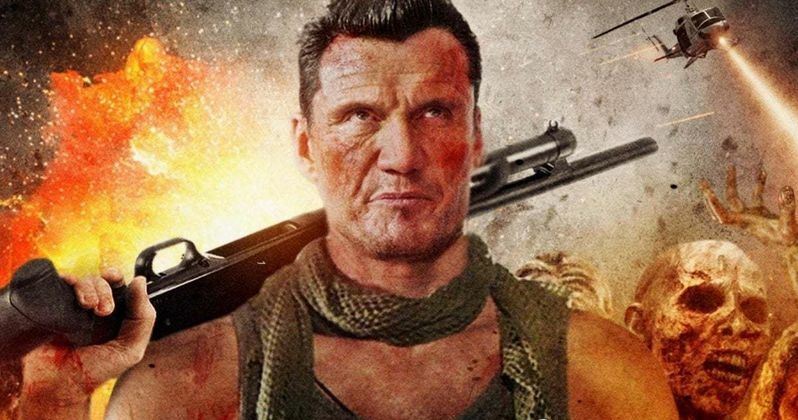 Saban Films has just unleashed the trailer and the poster for Dolph Lundgren shoots thousands of zombies in the undead face flick Dead Trigger. The zombie-action motion picture will be receiving a theatrical and VOD release this May and begins when a mysterious virus kills billions and turns many others into bloodthirsty zombies. From there it's up to once upon a time Frank Castle himself, Captain Walker (Lundgren) to lead an elite team to destroy these undead freaks and save the world. For those of you out there that might not know, Dead Trigger is based on a zombie-themed first-person survival horror mobile game of the same name developed and first published by Madfinger Games in June 2012 for iOS and Android mobile devices. The game is single-player only. Dead Trigger has over 23 million downloads, on all platforms, and a sequel, fittingly called Dead Trigger 2, was released in 2013. The first-person shooter video game can be played on iOS and Android mobile devices. The game is set in a world where a plague of an unknown source has killed billions of people and turned many others into dangerous creatures. The rest of humanity is desperately trying to survive in this world. Kyle, the protagonist of the game, meets a group of survivors led by Julian Lassagne that created a colony known as New Hope. He joins them and helps them survive. The group also finds a government-run underground bunker and slowly searches it floor by floor. They eventually find out that a wealthy group planned the plague. The storyline ends as Julian and Kyle decide to go after them. Dead Trigger is directed by Mike Cuff and Scott Windhauser, who is best known as the screenwriter of director Rob Cohen's The Hurricane Heist starring Toby Kebbell, Maggie Grace, and Ryan Kwanten; and the writer-director of Cops and Robbers starring Michael Jai White, Quinton 'Rampage' Jackson, and Tom Berenger. With that kind of experience under his belt, it makes a bit of sense then that Windhauser also wrote the screenplay with Heinz Treschnitzer based on the videogame created by Madfinger Games. Treschnitzer is set to pen Tom Savini's planned remake of Umberto Lenzi's Nightmare City starring Noah Hathaway, Ray Wise, and Diana Prince. Along with Dolph Lundgren, Dead Trigger co-stars Autumn Reeser, who is best known for roles such as Gabrielle Asano on Hawaii Five-0, Abby Bruce on Necessary Roughness, Kylie Sinclair on Last Resort, Leslie Bellcamp on The Arrangement, and Lizzie Grant on Entourage. Lundgren and Reeser are joined by Romeo Miller aka Lil Romero aka the son of Master P and nephew of C-Murder and Silkk the Shocker, and Isaiah Washington who is best known for his role as Dr. Preston Burke on my girlfriend's favorite show Grey's Anatomy and films such as Exit Wounds, Hollywood Homicide, and Ghost Ship. The zombie-action motion picture will be receiving a theatrical and VOD release on May 3rd. The film premiered in 2017 but is only now getting a release. The trailer for the film can be seen below. It comes to us via Saban's official YouTube channel.